Tomorrow, the United States Of America celebrates INDEPENDENCE DAY. 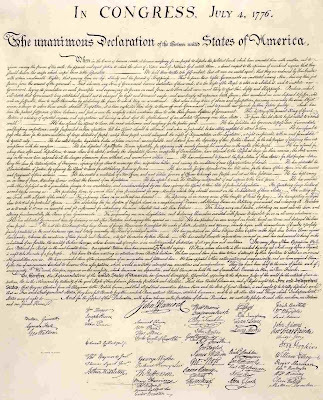 This is the day in 1776 when the Declaration Of Independence was signed by the representatives of the Continental Congress, which announced that the thirteen American colonies, then at war with Great Britain, were now independent states, and thus no longer a part of the British Empire. Contrary to popular belief it is NOT “Blow Your Fingers Off Fourth” or “Booze, Boating & Chicks of July Day”, nor is it “Barf On The Bar-B-Que Day”. Now, you can certainly enjoy the fireworks displays put on by every city, town and rural district in the country it seems, and no one is saying you should stay off the water or a chick tomorrow. I do however certainly hope, like driving, if you have imbibed alcohol that you stay away from the wheel of your boat also. Setting off your own fireworks is an American Right, IMHO...BUT, you must be safe and ensure children are kept a minimum of 50 feet away when you are lighting them. And having friends over for a Bar-B-Que and enjoying some cold wet beers is a wonderful way to celebrate…but please folks, while you are doing all of those things, remember that this is not just “The Fourth Of July”…it is INDEPENDENCE DAY. Two Hundred Thirty three years ago our country took on its own course. Could those 56 men have envisioned what has transpired over those so many years? Could they have envisioned the acceptance of those who were not protected by their declaration? That their slaves would be given their emancipation some 90 years later? Did they have any idea that women would stand up and fight for and win the right to vote alongside their husbands and sons some 150 years after they scrawled their names on that piece of parchment?? Obviously this document they signed was far from perfect. It only took 15 years before the first United States Congress took up the fact that the Constitution did not contain a Bill Of Rights for the citizens of this new nation. The Bill Of Rights (actually the first 10 Amendments to the Constitution of the United States) were introduced by James Madison to the First United States Congress in 1789 as a series of articles, and came into effect on December 15, 1791, when they had been ratified by three-fourths of the States. Thomas Jefferson was the main proponent of the Bill of Rights. The idea of adding a bill of rights to the Constitution was originally controversial. Alexander Hamilton, in Federalist No. 84, argued against a "Bill of Rights," asserting that ratification of the Constitution did not mean the American people were surrendering their rights, and therefore that protections were unnecessary: "Here, in strictness, the people surrender nothing, and as they retain everything, they have no need of particular reservations." Critics pointed out that earlier political documents had protected specific rights, but Hamilton argued that the Constitution was inherently different; "Bills of rights are in their origin, stipulations between kings and their subjects, abridgments of prerogative in favor of privilege, reservations of rights not surrendered to the prince. Such was "Magna Charta", obtained by the Barons, swords in hand, from King John." Finally, Hamilton expressed the fear that protecting specific rights might imply that any unmentioned rights would not be protected; "I go further, and affirm that bills of rights, in the sense and in the extent in which they are contended for, are not only unnecessary in the proposed constitution, but would even be dangerous. They would contain various exceptions to powers which are not granted; and on this very account, would afford a colorable pretext to claim more than were granted. For why declare that things shall not be done which there is no power to do?" Essentially, Hamilton and other Federalists believed in the British system of common law which did not define or quantify natural rights. They believed that adding a Bill of Rights to the Constitution would limit their rights to those listed in the Constitution. This is the primary reason the Ninth Amendment was included. • First Amendment – Congress shall make no law respecting an establishment of religion, or prohibiting the free exercise thereof; or abridging the freedom of speech, or of the press; or the right of the people peaceably to assemble, and to petition the Government for a redress of grievances. • Second Amendment – A well regulated Militia, being necessary to the security of a free State, the right of the people to keep and bear Arms, shall not be infringed. • Third Amendment – No Soldier shall, in time of peace be quartered in any house, without the consent of the Owner, nor in time of war, but in a manner to be prescribed by law. Fourth Amendment – right of the people to be secure in their persons, houses, papers, and effects, against unreasonable searches and seizures, shall not be violated, and no Warrants shall issue, but upon probable cause, supported by Oath or affirmation, and particularly describing the place to be searched, and the persons or things to be seized. • Fifth Amendment – No person shall be held to answer for any capital, or otherwise infamous crime, unless on a presentment or indictment of a Grand Jury, except in cases arising in the land or naval forces, or in the Militia, when in actual service in time of War or public danger; nor shall any person be subject for the same offence to be twice put in jeopardy of life or limb; nor shall be compelled in any criminal case to be a witness against himself, nor be deprived of life, liberty, or property, without due process of law; nor shall private property be taken for public use, without just compensation. • Sixth Amendment – In all criminal prosecutions, the accused shall enjoy the right to a speedy and public trial, by an impartial jury of the State and district where in the crime shall have been committed, which district shall have been previously ascertained by law, and to be informed of the nature and cause of the accusation; to be confronted with the witnesses against him; to have compulsory process for obtaining witnesses in his favor, and to have the Assistance of Counsel for his defense. • Seventh Amendment – In suits at common law, where the value in controversy shall exceed twenty dollars, the right of trial by jury shall be preserved, and no fact tried by a jury, shall be otherwise re-examined in any court of the United States, than according to the rules of the common law. • Eighth Amendment – Excessive bail shall not be required, nor excessive fines imposed, nor cruel and unusual punishments inflicted. • Ninth Amendment –The enumeration in the Constitution, of certain rights, shall not be construed to deny or disparage others retained by the people. • Tenth Amendment – The powers not delegated to the United States by the Constitution, nor prohibited by it to the States, are reserved to the States respectively, or to the people. Since then, 17 additional Amendments have been added to our Constitution. #13 abolished slavery, #19 gave women the vote. #18, adopted in 1919 shut the taps off and the holy Bagwine was made illegal. So as you celebrate INDEPENDENCE DAY, keep in mind the men and women since 1776 who have given their lives for the freedoms we enjoy today. The soldiers who continue to serve our country and give their lives in far away lands. The women who stood up and were beaten down, but persisted in gaining their right to be heard. Those who only asked to be accepted as human beings, equal to all others during the 50's and 60's. Men and women, black and white, the stood shoulder to shoulder against armed police, water canons and attack dogs. Their fight was long, but in the end they too persisted. Thank you for the reminder, my friend. Grateful I am. Grateful, humble, and quietly proud. A fitting tribute. Enjoy your weekend and Happy Fourth, Vinnie! As a practicing radical, baby Jeebus hating, Liberal. I hate my country. Cheers and Have Fun, Vinny!! LOL @ stay off the water or a chick. Have a safe and wonderful holiday weekend Vinny & Nancy! Nothing quite like Kate Smith. Nicely said, Vin! Have a happy 4th with your sweetie! My house is surrounded by beer swilling, fireworks lighting, BBQ fire setting trash - and they think I'm the one who is not patriotic - as the forefathers said - OY! "Could they have envisioned the acceptance of those who were not protected by their declaration?" Perhaps not specifically, but I believe the answer to this question lies in the words of the document, in the use of the words "we", "all", and "equal". Very well said, Bond. I hope you and yours are having a great Fourth of July.